Do you think I could find any shorter shorts? 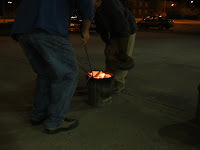 Amy sent me some more raku pictures from Wednesday night. You can see more pictures on her blog. Thanks Amy! 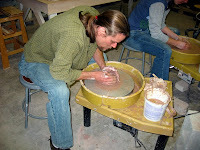 Removing my large pot from the kiln. 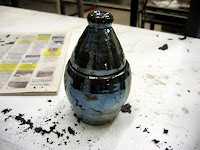 Joe graciously took these photos upon my request so I could show you what his finished bottles look like. Trust me, this is no slam on Joe's photography, but pictures just don't do these pieces justice. You really have to hold them in your hands and see how the light dances on them. 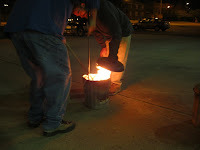 We had a good raku firing on Wednesday night. Everyone was pretty happy with their results, which is not so common. 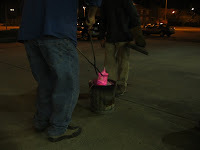 Joe's copper wash the last time we did raku. that finally hit the kiln. 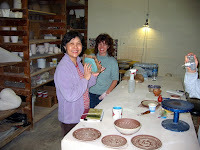 telling stories around the kiln. 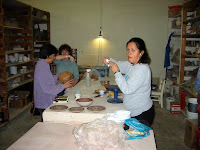 when we first opened the kiln. Joe is reaching for the left bottle. See the jaw of the tong on the left side? 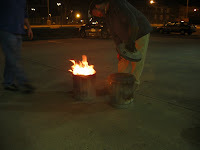 Taking the pot to the ash can. Carefully placing it in the can. 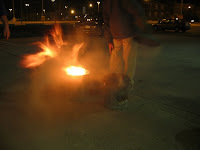 The newspaper starts to ignite. Greg puts the lid on it. 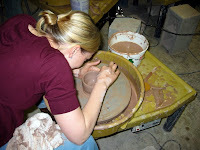 We always burp the luster glazes. I caught this just as Greg lifted the lid. The oxygen rushed in and it went "WOOF!" Greg is ready to put the lid back on it. 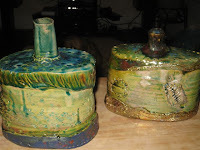 Unfortunately, I neglected to take photos of Joe's finished bottles. They came out BEAUTIFULLY and I was too busy admiring them when I forgot to get my camera. I will try to get some photos of them. They were really spectacular. 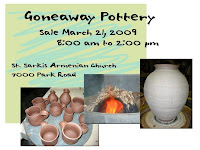 I have joined a sale at the St. Sarkis Armenian Church at 7000 Park Road on Saturday, March 21. If you're in the neighborhood, stop in. While today was "Pi Day" (3/14) and I made two pies (an apple and a cherry), I forgot to photograph them. 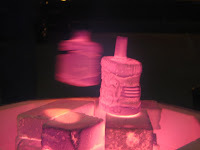 It's just as well; they tested good, but they weren't really photogenic. I only got one out of four tasks done today at the studio (well, two out of five if you count bringing the cherry pie with me). 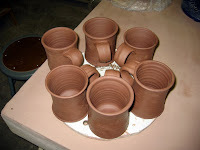 Lots more work to do on my current batch of earthen red creamer sets. Maybe on Sunday. Stephanie had to get some green bagels. My Speedball underglazes came on Friday. Can't wait to try them out. with parsley, sage, rosemary, and thyme. 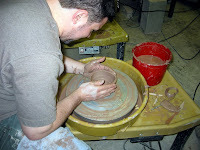 I handled some earthen red mugs and Greg made this udoo drum which looks intriguing. 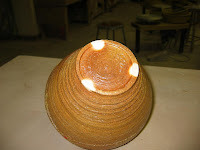 I got some earthen red pots that I made last year back from the glaze kiln. 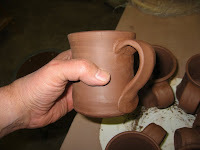 They got pretty dry on the shelf so I couldn't put handles on the small pitchers. 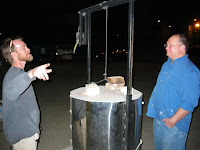 We loaded the gas kiln on Wednesday night, but the transformer burned out and the safety system shut the gas off at about 500 degrees. 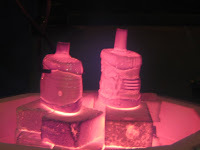 The new transformer came in on Friday and Julie said she is planning on firing it on Monday. Thanks Julie! Greg and Julie checking the burner controls. I found this somewhere in my surfing and enjoyed it so I thought I would share it here. 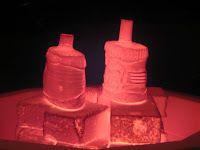 Ron offered to let us put some of our pots in his recent salt firing. I jumped at the chance and gave him one of my craggy crunch pots. 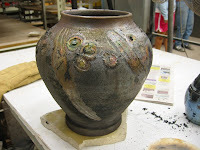 I lined it with shino and decorated it with a little bit of red and yellow underglazes. The rest is the salt. I was VERY pleased. Thanks Ron! I love the finish on this pot. 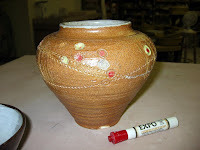 Proof of the salt firing --wadding marks! 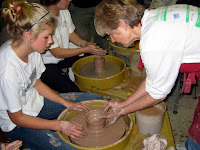 Here's a lesson to all us potters that fret and stress over teapots. Keep it loose like David Cuzick of San Diego, CA. 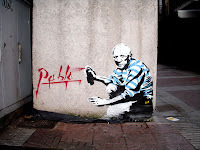 Check out his site here. 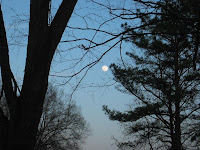 The moon was out while I was cooking on the grill tonight (yes, it was ~80 degrees here today. Sorry, folks in colder climes.) and I couldn't resist trying out a few shots. 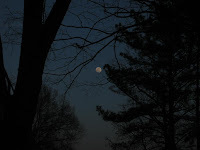 I couldn't capture the great colors and luminosity of the moon, but I got some decent shots. You can see the whole series here. I apologize that I forgot to post this picture from February 24, 2009. 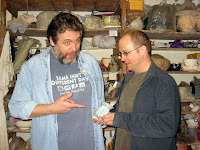 Ron brought one of Gary Rith's mugs to class that night and Amy took a picture of us admiring it. Ron was grateful and I was amazed. It's a great mug with a (wee) little pig on the handle. "Look at that wee pig!" Thanks for the picture, Amy. 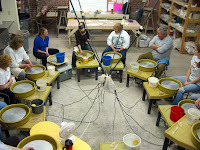 Saturday was Son of Glaze-a-thon II for me. 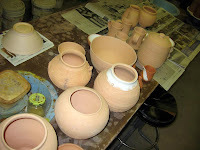 I had a lot of bisqued pots that needed to be glazed before Tuesday's kiln loading. 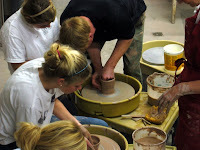 I counted twenty-three to glaze and six mugs to slip. 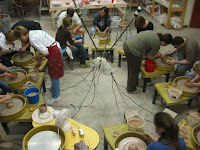 I'm not as intimidated by glazing as I used to be, but it really takes a lot out of me. 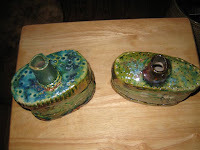 I spent hours glazing those twenty-three pots. Let's just hope they come out well. All that work deserves a break and a nice cup of Earl Grey. 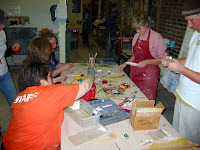 Thursday night Greg's class was making brushes. 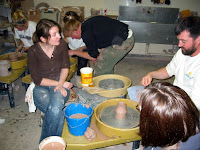 It looked like fun, but I would rather purchase them and spend more time on clay. 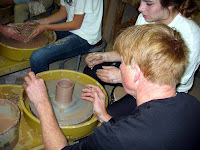 On Wednesday night, I handled some mugs I had thrown in earthen red on Saturday. 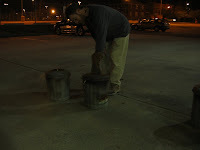 On Thursday night I threw some more and hope to handle them on Saturday. 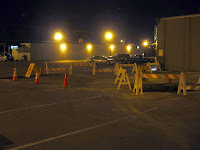 During our afternoon Muddy Fun class on Saturday we were told of a developing sink hole in the parking lot and we had to move our cars to higher ground. I'm sure the monsoons we were having were responsible for it and it didn't look too bad when I left that day. 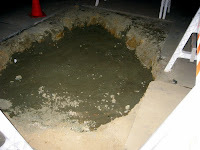 Thursday night it was opened up and it was apparently larger than I thought. 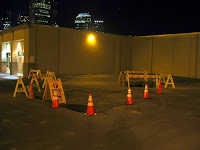 Good catch for the parking lot crew. 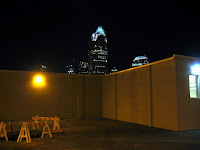 Our studio is right downtown. Life is deeper than it looks. 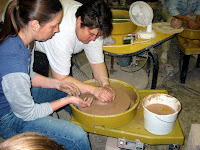 Saturday, February 28 was another Muddy Fun day at Clayworks! 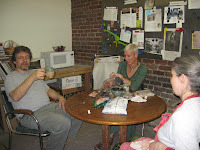 It was a rainy day and folks were happy to have a fun indoor activity. Did I mention it was Fun? Muddy Fun? 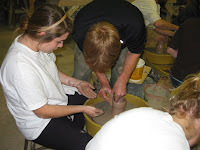 We had two good classes full of people that were not timid about working the clay as was evidenced by the amount we used. 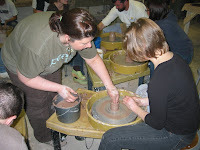 The next Muddy Fun classes are on Saturday, March 28, 10 am to 12 pm and 1 pm to 3 pm. 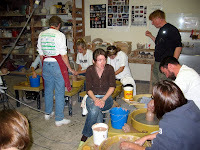 Julie demos to the class. are going to shoot from her eyes. Lots of learning going on. Did I mention Rick was helping?